Nux moschata. A tall, spreading tree, native only of the warm climates; the trunk is large, and the branches are numerous and irregular; the bark is of a greyish colour, and the wood light and soft. The haves are large, long, and somewhat broad: they are not unlike those of the bay tree, but larger and are of a beautiful green on the upper side, and whitish underneath. They stand irregularly, but often so nearly opposite, that they seem in pairs, as we see in the leaves of some of our willows. The blossom is of the shape and size of our cherry tree, but its colour is yellow. The fruit which succeeds this, is of the size of a small peach, and not unlike it in the general form; when cut open there appears first the fleshy coat, which is a finger thick, and of a rough taste, then the mace spread over a woody shell, in which is the nutmeg. We often have the whole fruit sent over preserved. 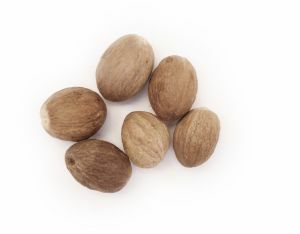 The nutmeg is an excellent spice, it strengthens the stomach, and assists digestion. It will stop vomitings, and is good against the cholic. When roasted be�fore the fire, and mixed with a small quantity of rhubarb, it is the best of all remedies against purgings.